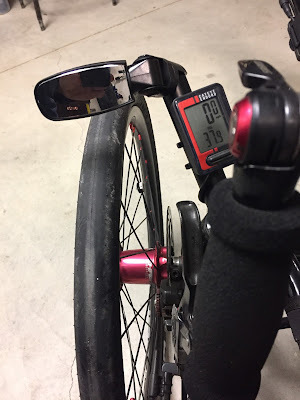 I wasn't sure if this little Zefal mirror would provide good visibility. On the road it has proven to be my favorite mirror. 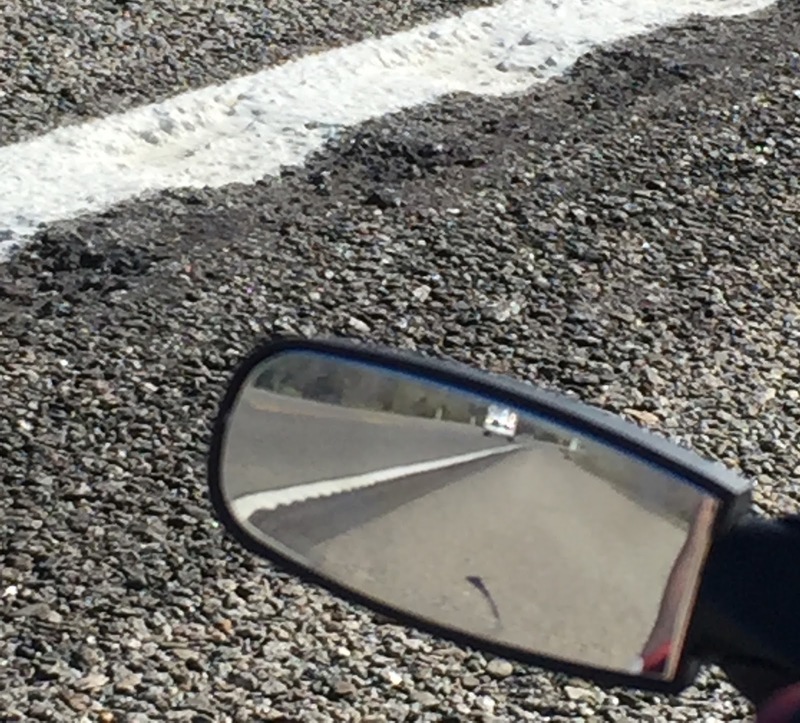 It has just enough curve in the mirror to give me clear coverage of the traffic lanes. The larger round mirrors I've used before provide equal or less coverage of the actual traffic lane and more coverage of the sky and the shoulder pavement directly behind my trike. I want to see cars not the sky behind me. 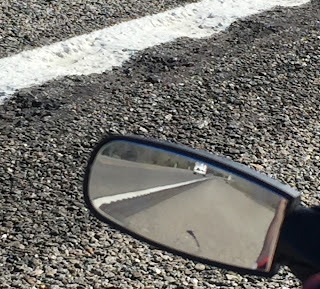 After a few miles I got use to judging distances in this little curved mirror. It looks good and it doesn't stick out like a wart on your nose. Not a great picture but you can get an idea of the coverage. The mirror is not blurred as seen in the picture. After less then 20 miles of test riding, the Sprint is going back to Bent Up Cycles. It's hard having to let go of a beautiful trike that rides so sweet. For me it's about the seat. It's not working for me with my titanium hips. All the details regarding the seat and my lousy hip are here on my November 7th post. I took the 700 on ride down the coast today to make sure it was the hard shell seat on my new ICE that was a pain in my hip and not something more ominous. Good news, bad news. Good news, my hip is no worse or better then it was before. The mesh seat on my 700 is oh so comfortable. I've never really appreciated the comfort of my 700. The bad news, the cool carbon fiber seat on my new ICE Sprint 26 FS has to go. I tried to customize the seat with the diamond pads that come with the seat but they didn't solve the problem. After about 5 miles the muscles in my right hip protest. Now I'll have to check out the ICE mesh seat. I wasn't comfortable with it when I initially tested it some time ago. If that still holds true then I'll have to consider selling my brand new ICE. I'm also thinking that the 25 degree seat angle of the 700 takes some of the pressure off my hip muscles. The max seat angle on the ICE Sprint 26 is 37 degrees. 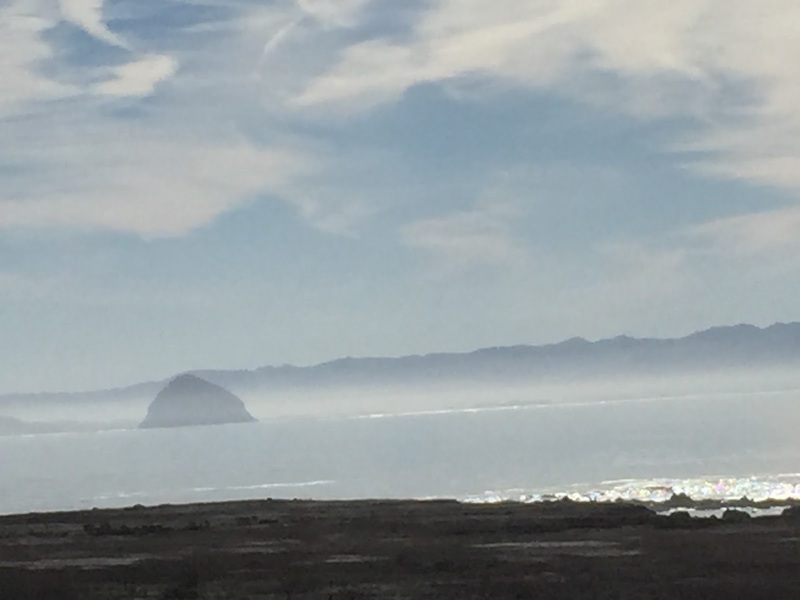 Looking out over Morro Bay. 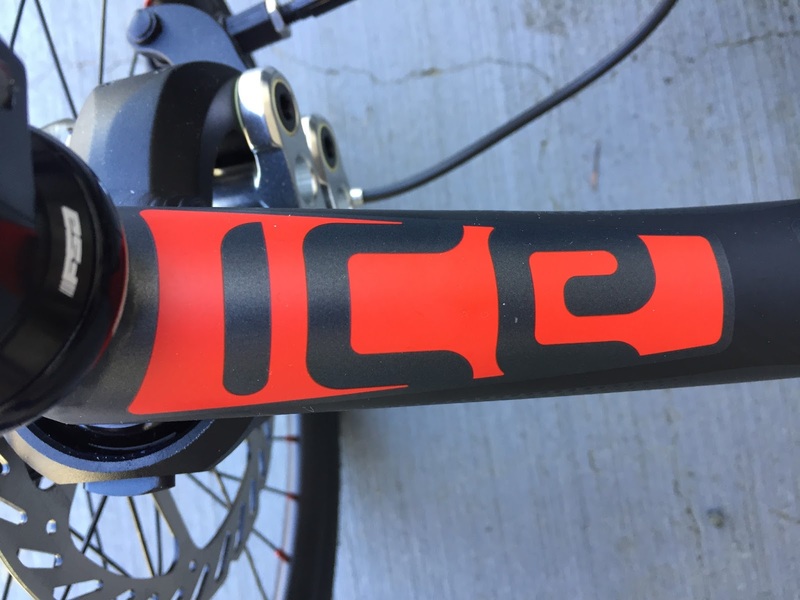 So far the rides on my new ICE Sprint 26 FS have been short. The carbon fiber seat is hard on my right titanium hip. 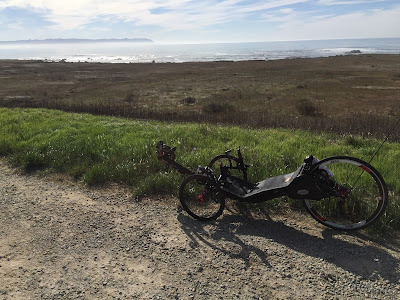 After about 5 miles my right hip starts to succumb to the hard shell seat. It seems like the hardness of the seat and the upswing at the bottom edge of the seat piriformus muscle. My left titanium hip is fine but the right side has been compromised by calcification of the tissue (Heterotopic Ossification) around the hip joint. On the positive side it only bothers me when I'm pedaling. Oh well. 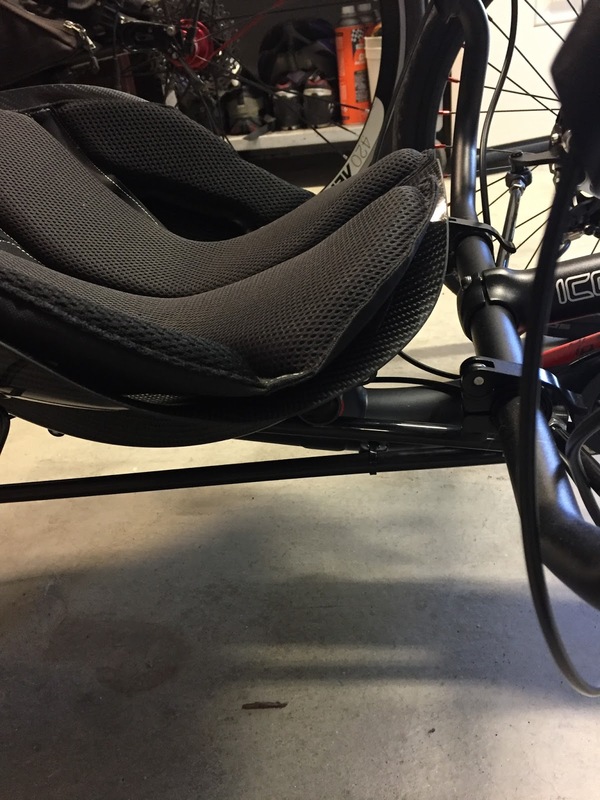 The mesh seat on my Catrike 700 is very comfortable and causes me no grief. So my next step is to take a closer at the ICE mesh seat. Although when I took my first (very short) test ride on a ICE mesh seat awhile back I felt like I was going to slip off the seat. I'll check out the ICE mesh seat again before making any hard decisions. Dang, the comfort of the Catrike seat has spoiled me. I hope I can find that same comfort with an ICE mesh seat. 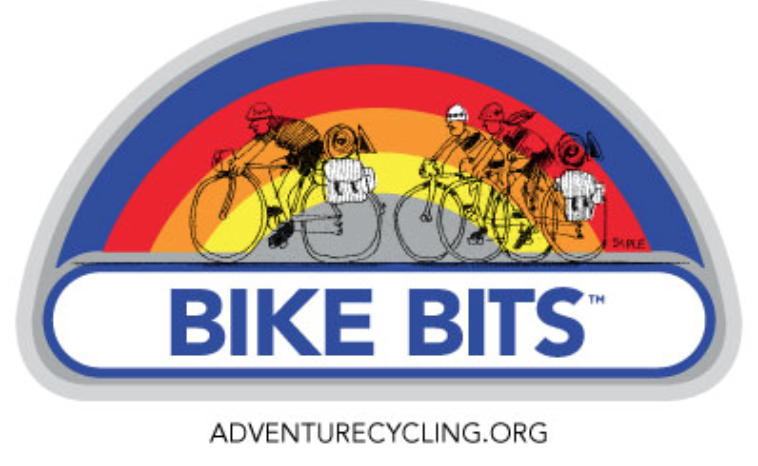 "COULD THE RECUMBANTISTS HAVE BEEN RIGHT THIS WHOLE TIME? 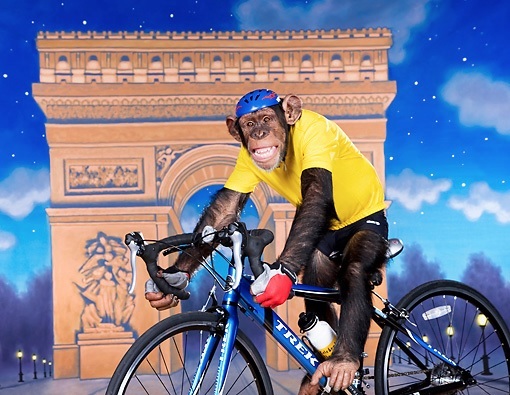 Turns out chimps are better suited to riding diamond-frame bikes than we are." It's well worth the read. Although traditional cyclists may take offense. It's good see a well respected organization like Adventure Cyclist make note of this article in CycleFit.